Several themes come together to make this book a great read. It has a mystery theme: the way this small town banker manipulates the inter-bank transfer process to get money and the way the big New York bank victims try to reverse engineer it to understand it and recover their money. It has a wicked, selfish, corrupt New York prosecutor reminding us all how much we hate government bullies. It has a very personal story about a good banker making a great sacrifice to protect his depositors, a story so appealing in our time of bad bankers. It has the historical theme of how to protect depositors during an economic contraction: something we have faced in the current crisis. It has a wife who loses her comfortable life and sticks with her man because she loves him and knows he is right. Finally, it is written in a pictorial and dramatic way that makes you see the Telluride mountains, the beautiful descending valleys to the plains around Denver, the big offices of the bankers and lawyers in Manhattan; and to see the faces and hear the voices of the banker, his wife, the hard rock miners and cowboys and the good and bad people who tell the tale. I really enjoyed traveling with CC, both his emotional, inner journey and his travel across the country as he sets in motion his masterful plan. Edward Massey is a talented wordsmith whose writing is crisp and memorable. Fascinating historical novel about the banking system before the FDIC and how one Bank President succeeded in protecting all his depositors from ruin by returning their money to them. Very uplifting read during these bleak economic times. Massey’s first book is a must read. I’ll look for more of his work to come. Who would think a book about banking would be so great a read! Edward Massey has taken a forgotten bit of history and expanded it into a wonderful story, which resonates today. C.C. Wain, the honest banker who kept his promises, becomes a full and inspiring character in Mr. Massey’s hands. The Colorado landscape, the banking climate of the day, the food and pastimes of the people, are all vividly described. Telluride Promise is the story of how one small town banker, CC Wain, saved his depositors and the economy of Telluride from the worst ravages of the Great Depression. So why read another story about another banker? Aren’t we all living through our own economic mess, brought about in large part by bankers? Well what if we had been protected by our bankers? Based on a true story, this novel could not be timelier. Set in the 1920’s, this debut novel from Edward Massey, moves from a small mining town in the Rockies to the corridors of Wall Street. Sagely predicting the general collapse of community banks, CC Wain found a way to make all of his depositors whole by returning each depositor’s cash before the collapse struck Telluride. His commitment to his depositors, his wrangling, musings, his stand off with law enforcement and his relationships with family and friends, makes a fascinating tale. Massey has meticulously researched his subject for over a decade, discovering unpublished documents providing penetrating insight into the inner workings of the banking community of 80 years ago and into his hero’s odyssey to save Telluride. Yes, it’s another story about a banker. But this one wears a white hat. If you want to read a book that will lift your spirits in these economic times, this is the one. If you know a banker with the integrity of CC Wain, treasure him. He’s a rare breed. TIME’s managing editor recently wondered whether bankers cared about anything other than compensation. CC Wain did. 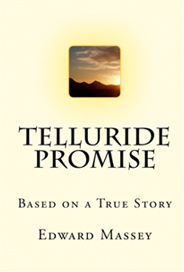 Read Telluride Promise…you’ll be glad you did. Tale of a small banker in 1929 Telluride who does big things to save his depositors from the financial catasrophe he feels certain is to come. Beutifully and movingly written, history and humanity come alive as we follow the intricate, step-by-step efforts of lead character, as well as wonderfully drawn supporting cast. Massey is a first-timer, but his prose and story evoke Dreiser, Steinbeck, and even Faulkner. Lovely and true. What a wonderful book. Massey does a masterful job of bringing the story of CC Wain to life. Set in the West, the story soon turns to NYC, politics and big banks. CC Wain is determined to save his depositors. Telluride Promise provides a look at life just before the banks collapsed and the Great Depression of the 30s. CC Wain does what he believes is right. Will he pay the price for his convictions? This book is truly engaging, with characters you’d want to meet today. Grab a copy, you’ll be up late trying to get through to the end to learn what happens.